Slow cookers and multi-use pressure cookers are all the rage right now, but there’s a big difference between this trend and most others: people’s infatuation with slow cookers is completely warranted. This miraculous gadgets take so much of the hassle out of cooking. And because they cook food in a sealed pot, all of that delicious flavor is locked in. 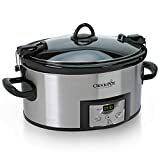 If you haven’t hopped on the slow cooker train — or if you’re due for an upgrade — you’ll find the best slow cookers at every price point under $100 listed below. 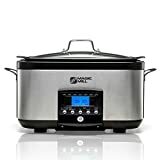 PREMIUM COUNTERTOP APPLIANCE – THE SLOW COOKER YOU’LL FALL IN LOVE WITH – One of the industries best rated Kitchen appliance, Magic Mill 5-in-1 Multi Cooker simplifies combination cooking by allowing you to bypass traditional stovetop cooking. Rather than browning ingredients in a separate pan and then combining them in another pan, you can do it in just one pot – with its 6-quart capacity, you can cook delicious meals for the whole family! 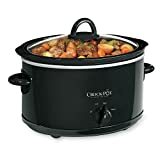 BPA FREE – NON-STICK INNER POT – This best seller 5-in-1 Multi Cooker allows you to cook a wide variety of dishes in just one innovative product. 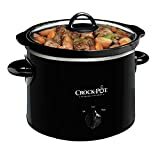 It uses a technology that spreads heat evenly to perfectly cook, sear, roast, sauté, and brown ingredients without sticking to the pot and making a mess! Plus, every component is BPA-free, so you can be confident that it is safe to use. PROGRAMMABLE CONTROL PANEL + LCD DISPLAY – This amazing multi-cooker is very easy to use. It has several buttons, which you need to set prior to cooking a dish. There is the slow cook button for slow cooking, the timer button for setting the time, the power button to turn the appliance on or off, and the LCD Display screen to show the current settings of your cooker. EASY TO CLEAN – DISHWASHER SAFE – This multicooker is not only easy to use it is also easy to clean. Because of the NON-STICK POT, the dishwasher safe glass lid and rack cleaning up is a breeze. It comes with removable parts with a separate streaming rack, so you can use it in your dishwasher safely and conveniently. Enjoy meals and love the mess as well with this 5-in-1 slow cooker. 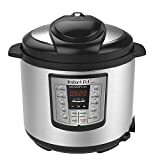 HIGHLY RECOMMENDED BY SMART HOUSEHOLDS – With the convenience it offers, it is no surprise why Magic Mill 5-in-1 Multi-Cooker is positively received by the market. That is why smart households highly-recommended this appliance to other people out there. Do not worry, though. In case you have questions about this cooker, let us know. We will do our best to respond to you as soon as possible.